In order to fix your rankings, first you need to be positive which of Google’s two significant recent updates has caused the problem. If you look at your analytics statistics, you will see a significant traffic drop on or around the 24th April 2012 if Penguin is the cause. Whichever keywords dominate your back-link anchor text will usually be the ones hit hardest by Penguin. There is a free back-link checking tool at majesticseo.com which will show you the keywords currently being used in your back-links. The Penguin algorithm requires text link density to be less the 5%. Your back-link anchor text profiles need to be mostly URL links, Brand related links and junk links rather than keyword rich ones. Use your variations of your registered company name for Brand links. Make sure that you use a large variety of URL links. Focus on building high quality links from different IP addresses. Links from topic related sites are much more useful to you then they used to be. Domain authority can be measured by Google PR and ‘Trust’ score metrics. Build back-links from other domain pages with back-links. Automated link networks might seem like a great idea at the time but the usually only produce lower quality links ultimately Google will find the network, devalue it and penalize the websites it finds within it. Don’t go mad with your content keyword density, less is actually more for the new Panda algorithm so strive for around 2%. Add an external link within your page content to an authority .gov or .edu site because Google’s quality algorithm wants to see external authority links. You should have only the best quality, unique content on all your pages. Use contextual links to link keywords in your content to related pages of information either on your site or on a different ‘authority’ domain. Where possible you ought to include suitable images and videos. A video will help to boost the time visitors spend on your site and images help to break up large blocks of content, improving readability. The image alt text attribute is the perfect place to put longtail keyword rich image descriptions. Use different variations of phrases for each image. Make sure that you spell check all your content and that it makes sense to you. Google can determine the ‘reading age’ for different text which enables it to establish if a professor or a schoolboy wrote your site content. Your site content must be as long as it needs to be in order to cover everything you need to say. However, pages with less content tend not to rank as well. Over 500 words appears to be beneficial. It is best to focus on your readers, and not write just for search engines. If you write quality content that people like and engage with then the search engines will reward you. Google has the technology to relate similar meaning words together, so it isn’t necessary to repeat your most important keywords in order to get them noticed, instead you can use different words that mean the same thing and Google will relate those words for you. This lets you create content in a much more natural style. You will be penalized in the search results if your site contains duplicate meta-data. Each page should have meta-description tags which are unique to that page alone. A well-written and compelling meta description tag will improve the volume of clicks you receive from search engine traffic so write the most interesting description tags you can. Google penalizes slow loading content. Check that your content is fast enough using YSlow in Firefox. The bounce rate for your site is an indication of how many visitors engage with your content rather than hitting the back button when they arrive. You need your bounce rate to be less than 55%.Your traffic should ideally stay to read your content. Those that leave immediately contribute to your site ‘bounce rate’ which should be less than 55% to rank well in Google. You should do all you can to increase the average page views per visitor statistic because Google uses this as an important indicator of the quality of your websites content. The average time on site is an important metric for your quality score. 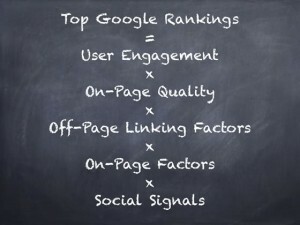 The longer people spend on your website, the better your rankings will probably be. For more information about improving your website & rankings, you can talk directly with Dave Holland (from https://www.deehoseo.com) the web design specialist we grilled for this article, ask him questions about your site and pick his brains for the tips and techniques you need to succeed online & in search.